This one piece plywood bistro chair is produced for high end establishments with lots of customer traffic. The chairs are very durable and easy to store. Held in stock for a quick delivery. 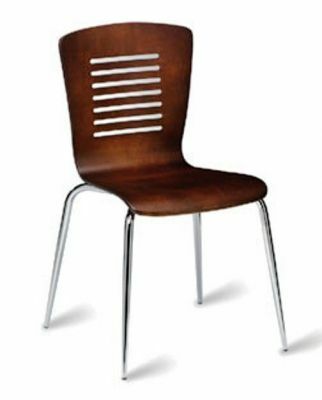 Modern design bistro chair in Wenge finish. Features of the chair include decorative slots on the back of the shell for a stylish finish. Constructed to a high standard the shell sits on attractive chrome legs.